I love a good gelato. Out here I have to go all the way downtown to get some. Sure I can pick it up from the grocery store, but where is the fun in that? After a nice spicy meal there is nothing better than a bit of gelato to finish it off. I don’t know why but when my tummy is not well, I find a nice tart gelato like lime or raspberry really helps to settle things. It must be the happy that comes from gelato. How many more times can I say gelato today? Gelato…it will become my new battle cry, forget spoon! It is all about gelato! I have mentioned I’m a geek right? yyyeah. Whisk together the evaporated milk and flour, set aside. In a saucepan, whisk together skim milk, splenda or honey, and zest. Bring to a simmer over medium heat. Add the evaporated milk mixture, whisk continually until the mixture begins to bowl and thicken. This takes about 5 minutes usually, can be more or less. Allow to cool completely, some folks set the pan in an ice bath. This is more traditional I believe. I usually just let it sit. Puree the mango and lime juice. Remove the zest from the milk custard you created. Add the custard to the blender and puree together. Freeze the mixture in your ice cream maker according to the directions, usually around 20 to 25 minutes. I prefer to eat mine right out of the maker. I like the soft serve texture. If you like a harder textured gelato then transfer to an airtight container and freeze for 2 hours (it will keep in the freezer for about 1-2 weeks). I have not tried my freezer method I outlined in my kiwi green tea sorbet recipe. I’m spoiled with my ice cream maker. Please share if you have a success with that! Makes 4 servings. Each serving containing splenda is 124 calories, .4 grams of fat and 1.2 grams of fibre. With honey it is 253 calories, .4 grams of fat and 1.3 grams of fibre. 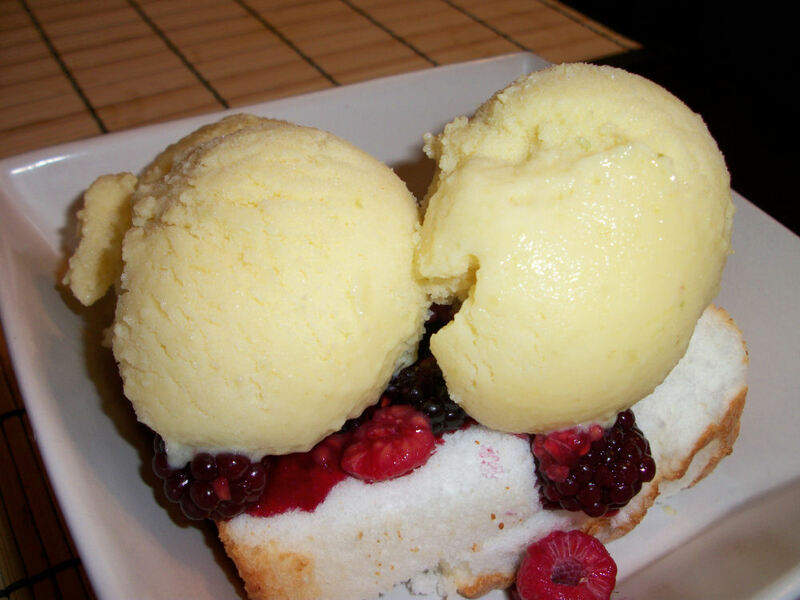 A great way to serve this as a complete dessert is with a couple slices of angelfood cake and some local berries as pictured. It is really great on its own too though. Mmmmm. This is a quick lunch I whipped up the other day. 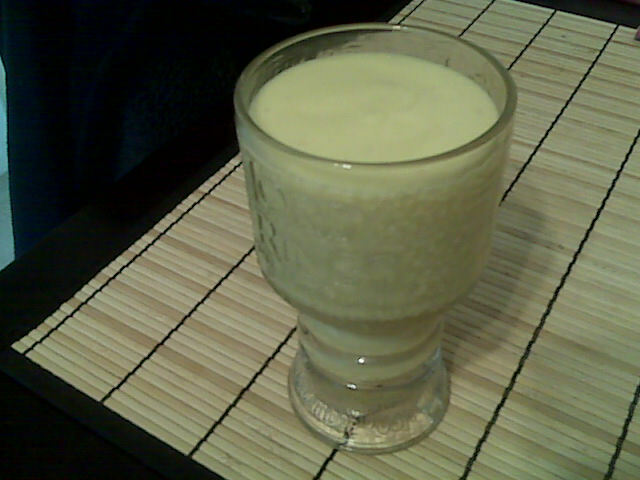 I really wanted something with mangoes in it but needed it to be quick and easy because I had other things to get to. I think this would pack really well for a boxed lunch at work or school as well. So easy to just have ready and tasty too! Very filling, hurray for couscous! Combine the chicken oxo and couscous in a heat proof measuring cup. Add 3/4 cup boiling water and cover with plastic wrap. Allow to sit atleast 5 minutes. Combine the mango, green onion, lime juice, and soy sauce in a large bowl. 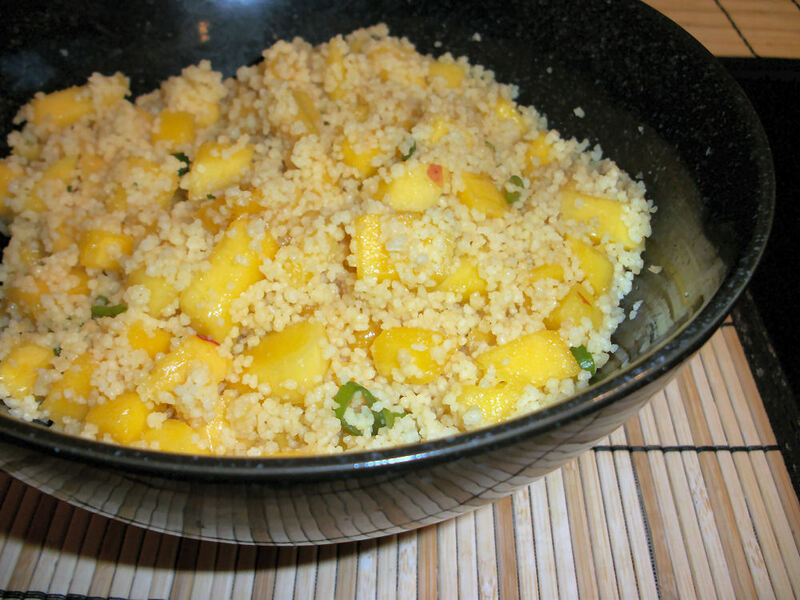 Once the couscous is done sitting, add the couscous to the mango mixture. Mix thoroughly, serve! This makes two lovely lunch servings. Each serving contains 182 calories, .5 grams of fat, and 3.6 grams of fibre. If you skip the chicken oxo ingredient this is a tasty vegetarian dish as well! A variation of this with strawberries instead of mangoes is sooo delicious. This can also be a great side dish for a tropical themed dinner.